On July 9th at Comic-Con International: San Diego, MAD Magazine Editor in Chief John Ficarra delighted longtime fans with the announcement of Spy vs. Spy: An Explosive Celebration. The newest Spy installment will feature 150 Spy vs. Spy adventures, presented for the first time in full color, Spy vs. Spy trivia and stats and an appreciation and selection of strips by long-time Spy vs. Spy artist Peter Kuper. The new Spy vs. Spy collection is filled with lots of extras both longtime fans and first-time agent provocateurs will love, including a new foreword by angry-faced comedian Lewis Black and a new graphic remembrance, “My Friend Antonio,” written and illustrated by world-renowned cartoonist Sergio Aragones. Spy vs. Spy: An Explosive Celebration will include 11 never before seen and four classic Spy vs. Spy art images, commissioned by an all-star lineup of comic and graphic artists: Orlando Arocena, Peter Bagge, Tom Bunk, André Carrilho, Darwyn Cooke, Evan Dorkin, Gilbert and Jaime Hernandez, Jim Lee, Hermann Mejia, Tony Millionaire, Yuko Shimizu, Bill Sienkiewicz, Bob Staake and Richard Webber. The book will also feature never-before seen images of a large-scale LEGO® sculpture created by internationally acclaimed brick artist, Nathan Sawaya. 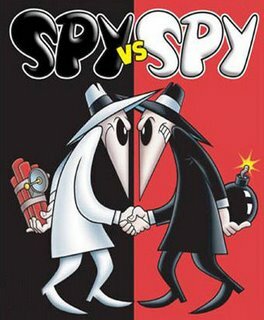 For more information about Spy vs. Spy: An Explosive Celebration and MAD Magazine, visit: http://www.madmagazine.com/.